Paasche AIRBRUSH TANNING KITS are professional grade and allow you to SPRAY ON a beautiful, safe tan! 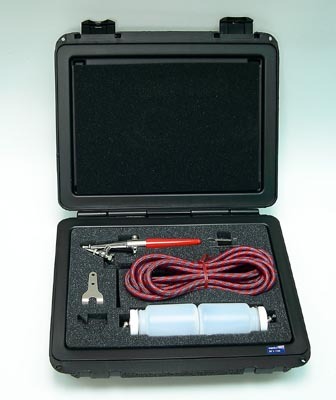 Kit "A" comes in a foam lined, impact resistant travel/storage case with locking clips. Kit "B" is the same as kit "A" but does not come in a case. 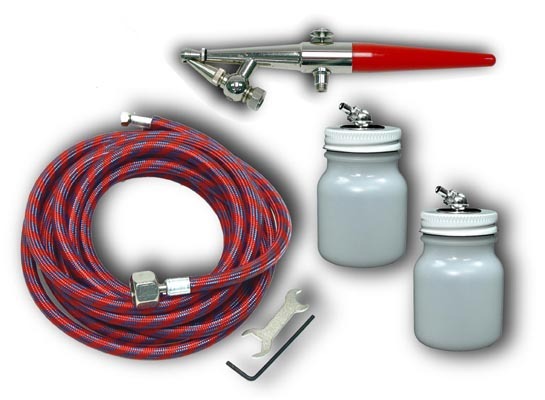 Both kits include a Paasche HS single action airbrush with screw-on jar coupling that allows freedom of movement (jar won’t fall off). Airbrush is heavy-duty machined brass with a polished nickel finish and high impact plastic handle. For right or left hand use. Working pressure of airbrush is 20-45 lbs. PSI. Important: For HOME USE the manufacturer recommends that you use Compressor #349-934-05 with this tanning airbrush. (Click below to view.) Other parts included are listed below photos. Airbrushes are warranted 1 year by Paasche.